As a representative of the Milton Cycling Participation Strategy (CPS) Committee, I was invited to attend the 6th Annual Ontario Bike Summit in Toronto this past week. The two-day event was attended by local cycling advocates as well as municipal and provincial government representatives from across the province. The Bike Summit is organized by the Share the Road Coalition, a cycling advocacy organization led by the indomitable Eleanor McMahon, whose passion and determination to make cycling safer for everyone was sparked by her husband’s tragic death in a cycling collision in Milton in 2006. After opening remarks by McMahon and Toronto City Councillor Denzil Minnan-Wong, Ontario’s Minister of Transportation & Infrastructure Glen Murray took to the podium to make a major announcement: $25 million in dedicated cycling infrastructure funding over the next three years. This is something the cycling community has been demanding for quite some time now, so there was palpable excitement when the announcement was made. In addition to the funding, which is being split between provincial and municipal infrastructure, it was announced that the province’s new policy will be for cycling infrastructure such as paved shoulders and cycle paths to be automatically incorporated into every new provincial road project moving forward. Murray also spoke about Ontario’s comprehensive new Cycling Strategy (#CycleON), as well as the Keeping Ontario Roads Safe Act which includes many important changes such as increased fines for ‘dooring’ and a 1 metre safe passing rule. 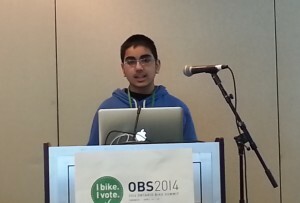 The announcement was followed by the Bicycle Friendly Community Awards. These are given to towns and cities that have gone above and beyond to welcome and encourage cycling through infrastructure, education, and promotion. 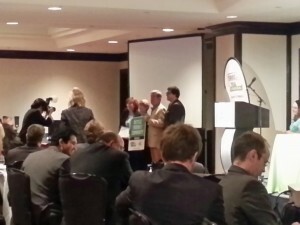 One of this year’s Bronze winners was our neighbour to the North, Halton Hills. That makes Milton the only town in Halton Region that has not been recognized as a Bicycle Friendly Community – a situation the cycling community here hopes to rectify soon. With the Velodrome opening soon and the Pan Am Games coming up, Milton is in a perfect position to brand ourselves as the Cycling Capital of the GTA, and achieving Bicycle Friendly Community status is something we can leverage to bring in both tourists and high quality employers. 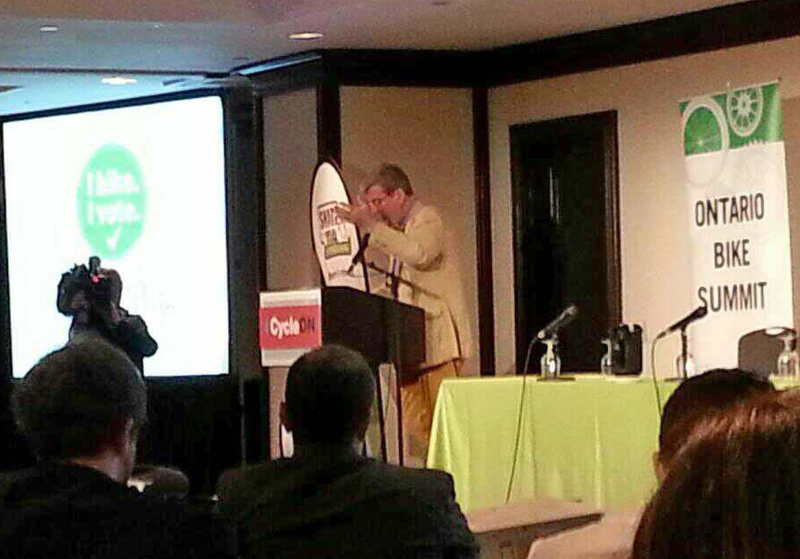 One of the speakers at the conference was Pittsburgh Mayor William Peduto, who explained exactly why it is so important for municipalities to be bicycle-friendly. His city went from being ranked the worst city for cycling in the United States to number 35, due to a comprehensive cycling strategy, investments in cycling infrastructure, a focus on ‘complete streets’ that serve all modes of transportation, and a revitalized waterfront that replaced abandoned industrial facilities with public spaces and cycling trails. The result? Pittsburgh has turned the tide of rust-belt depopulation and has begun to attract high-tech companies like Google whose employees actively seek out communities with good cycling, transit, and walkability. Thirty percent of their residents now walk, bike, or take transit to work – one of the highest percentages in the States. As my main purpose for being at the summit was to gather information for the CPS, I made a point of attending breakout sessions that explored ways to increase participation among under-represented groups. 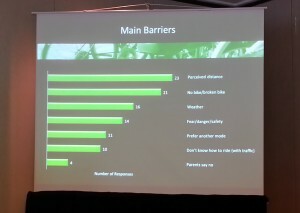 During one of these, I got to listen to a number of educators and young people speak about engaging youth in cycling. For example, representatives from Central Commerce High School in Toronto talked about their innovative Bike Shop program where students are taught to maintain and refurbish bikes – and then get to keep the bikes. One of the speakers was Milton’s own Kay Shaw who talked about his experiences at Craig Kielburger Secondary School. Kay was at the STR Youth Summit and has been working to get more kids to ride to school by explaining how much freedom it gives them, and how much money it saves. His biggest complaint? Bad bike parking at Craig Kielburger. Muddy, poorly spaced, and unsheltered bike racks discourage a surprising number of students from riding to school. And it’s such an easy fix. All in all, it was an inspiring and informative couple of days. It gave me lots of great ideas for how to encourage cycling of all types in Milton, and a vision of how we can improve our streets for all users – drivers, pedestrians, and cyclists. This is great! Can I share with others? Please note that there will be a Bike Fest at the MEC Burlington store on May 24th. You may want to follow-up to ask if you can have a booth there.